The good news for the fans of Assassin's Creed game series! According to the fresh rumors, one project in this franchise - Assassin's Creed: Unity, the release of which is scheduled for this year, - will have a co-op mode. The first person who told this information in his Twitter’s account was a user with a nickname Shinobi602. You may have heard about him thanks to his activity on NeoGAF site. So, firstly, this user, then The Escapist portal, referring to its source in the developer’s company, have told that Ubisoft will present two Assassin's Creed: Unity demos at annual E3 expo, which will take place in June. The first demonstration will traditionally show the single-player campaign and the second one (for the first time in the whole series) will introduce “narrative” co-op mode for 4 persons. The Escapist site has also mentioned that there is a big probability that only one Assassin's Creed: Unity demo will be shown at Ubisoft press conference, and the another may be demonstrated at Sony's PlayStation presentation. 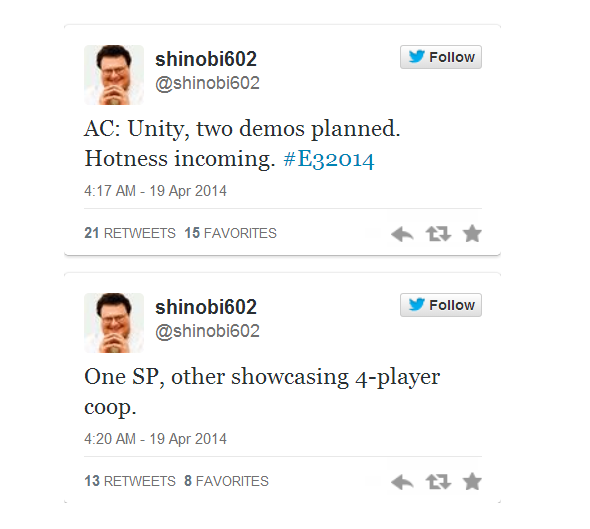 And what do you think about Assassin's Creed: Unity demos and co-op mode? Would you like these rumors to be true? Your answers can be left at the bottom of the page. And if you want to know more about this upcoming project, then we advise you to read our previous article about Assassin's Creed: Unity game.